The sun rose over a timeless rural scene of India. The young men of the village began arriving. They sat on the ridge and watched. They had not come to see the eclipse but to watch us. 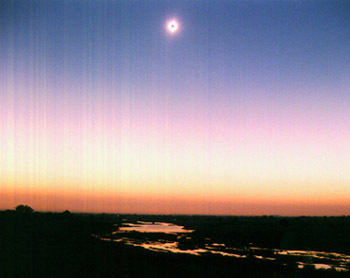 The 1995 eclipse was the shortest trip to date. A mere 2 weeks and we confined ourselves to the Delhi - Agra - Jaipur triangle of northern India. A month earlier we had returned from a one year trip in South and Central America. Of the many countries I have visited, India is my favourite. The sheer variety of people, cultures, religions, languages, architecture, and history always leaves me breathless. I need no excuse to visit this country. 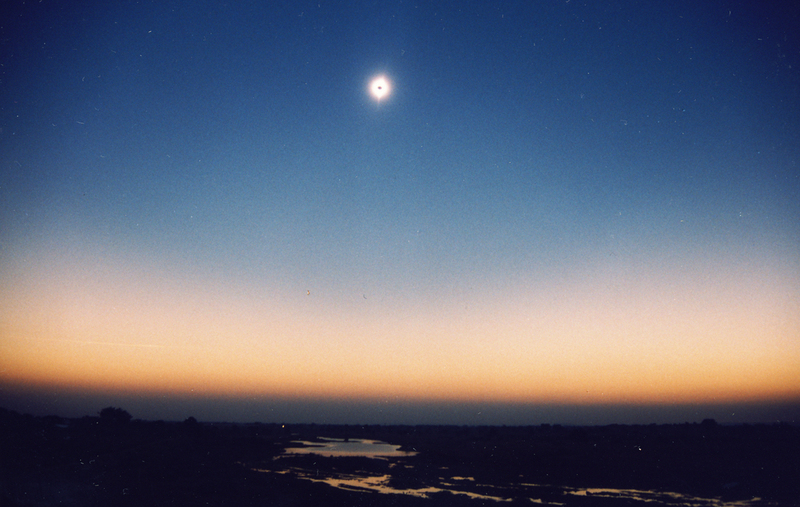 On 24 October 1995, a Total Eclipse of the Sun was due to pass across North India on its way across Asia. The path of totality was very narrow, a mere 43 km. The duration of totality was only 54 seconds. 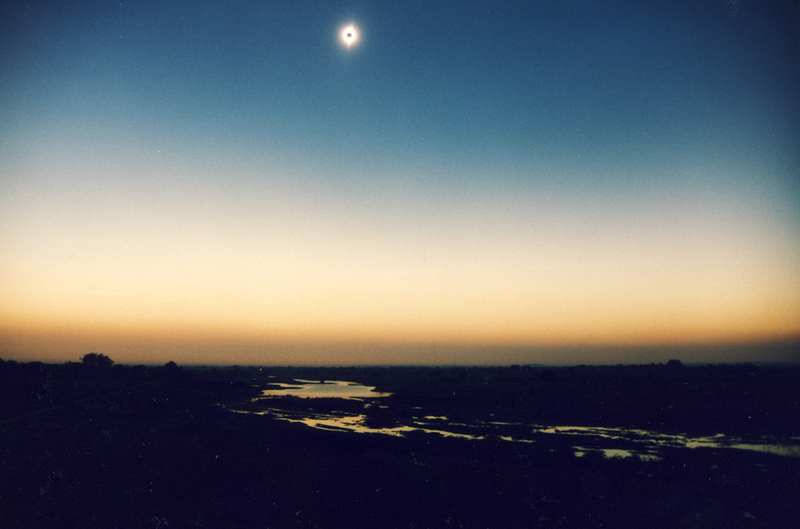 We had returned to England only a month previously from a one year trip around South America after the 1994 eclipse. We needed to work but we had been unable to resist coming out. We stayed in Agra close to the Taj Mahal. This was just outside the path. The deserted Moghul city of Fatehpur Sikri, 25km away was very close to the centre line. There was excitement all over India. The rationalists were looking forward to seeing one of nature's most spectacular phenomena; the superstitious were horrified at the thought of being cursed with bad luck. We met many people who had come to see this eclipse. Stan Kleinstein and Mark Mehlenbacher were two Americans we'd met on the Galapagos Islands, a few months previously. 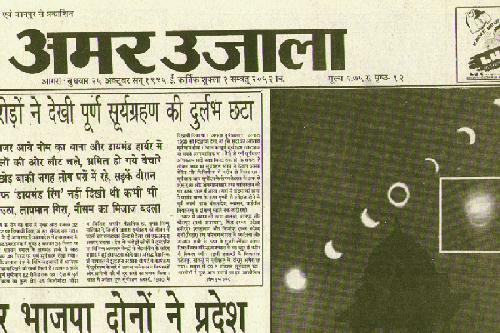 Evidently, our stories of the 1994 eclipse had so inspired them, that they came to India! They were with a tour group and complained that their trip was too sanitised. We responded by taking them walking through the crowded bazaars and riding bicycle rickshaws through the chaotic traffic. Glen Schneider was on his 18th total eclipse. He told us he had been clouded out four times. 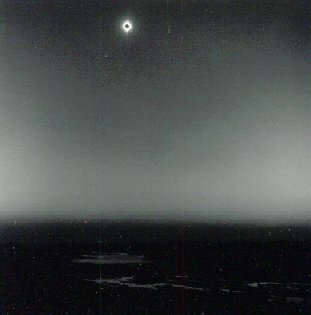 For the 1986 eclipse he had flown in a hired plane to catch four seconds of totality at 14,000m. There are indeed some very eccentric eclipse chasers around. In 1994 we had met two Slovak astronomers. This time we met two Czech astronomers. They were looking for the two Slovaks! Even more bizarre were a group of Londoners who were looking for a couple who "travel the world following eclipses". That, of course, was us. By now I knew enough to bring plenty of photocopies of the path of totality to hand out. A group of 300 amateur astronomers from Bombay asked us for an interview - they wanted to write about us in their monthly magazine. A European magazine had hired an English journalist to photograph the Taj Mahal during the eclipse. He asked me for advice. Since the eclipse would not be total at the Taj, I told him to take his photos at sunset - his editor would never know - and go south for totality. The day before the eclipse, we left most of our things in our hotel room in Agra. We hired a taxi to a small village called Khanua, 10km from Fatehpur Sikri. This village was on the centre line. 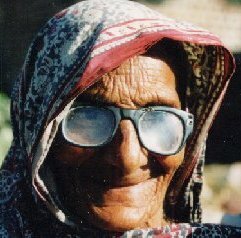 Talaat's knowledge of Hindi was enough to give us confidence in finding a place to stay. The group consisted of Eric (from Holland), Bryce (Australia), Richard and Sylvie (France), Talaat and myself. Another taxi full of students from England would arrive in the morning. One of them was Dave, my cousin's best man, who was travelling for a year through Asia. By chance, we had ended up staying in adjacent hotels. Richard, Sylvie, Dave, Talaat and Kryss. The roads out of Agra were crowded. Part of this was due to the eclipse. The day after was Diwali. This is one of the most important Hindu festivals. It took an hour to cover 4km. We passed Fatehpur Sikri. Here totality would be 50 seconds. 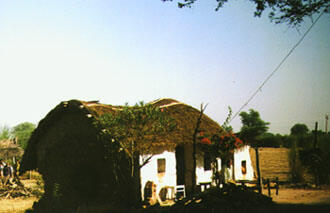 Thousands of visitors were expected and accommodation was packed. We continued along a bad dirt road for another 10km. This would give us seven seconds more and get us away from the crowds. So we hoped. The house in Khanua where we stayed for one night. Khanua was tiny. There were a few houses around a cross-roads. We quickly found a place to stay. On the edge of the village was a checkpoint. The civil servant who manned the post said we could stay in his hut. 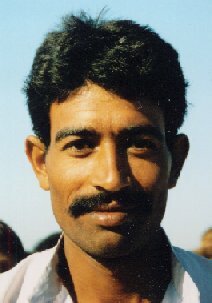 Jagmohan was a tall, handsome Rajasthani with a black moustache. He was very proud that we had come to see the eclipse in his village and had chosen his humble dwelling as our base. A few charpoys were set up for us. Charpoys are simple beds. Some of us slept inside the hut, others outside. There was no plumbing. The toilet was a bush behind the hut. Water was taken from a large clay pot. Tea was brought to us from a tea man nearby. A neighbour made us lentils and chapatti. It was all very simple but cosy. We shared some sweets that we'd brought. It is a custom to offer sweets for Diwali. It was clear and cool as we slept. I could hear grunting outside. Eric later told us he had a pig sleeping under his bed. Every time somebody went behind a bush, the dog would follow and sit nearby on guard. I was awake early on eclipse morning. We had already found our eclipse site. To reach it we walked through the village past cows, buffalo, goats, sheep and camels. On the far side of the village was a ridge with a narrow flat area on top. 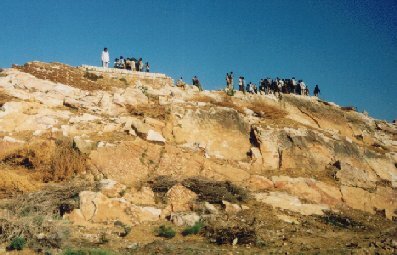 A Moghul army had once fought from here. Now it was used as a place to dry cow pats for later use as fuel. While we set up our cameras, a young girl was bringing up a full basket for drying. Sunrise over the fields of Khanua. The sun rose over a timeless rural scene of India. The young men of the village began arriving. They sat on the ridge and watched. They had not come to see the eclipse but to watch us. The ridge from where we saw the eclipse. It was flat all around. In the West were fields and a couple of Moghul kiosks built by the emperor Barbur. 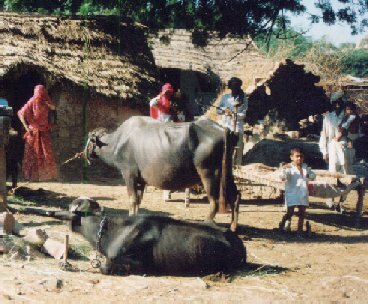 Bullock carts were carrying farmers out to work on their fields. 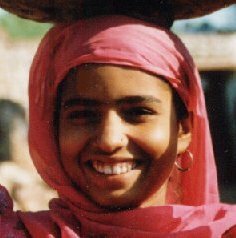 Women were carrying pots of water on their heads from nearby wells. Goats grazed. Further along the ridge was a troupe of monkeys. In the East the sun had risen over some ponds and the houses of the village. At 7:25 it was time for first contact when the Moon begins to cover up the Sun. Nothing could be seen with the naked eye. With our mylar filters, I could see a tiny bite taken out of the Sun at the top. We followed the encroaching Moon; it took over an hour to move across the Sun. The villagers were very excitable as they passed around some mylar goggles. Sometime after 8:20, I noticed it had begun to darken in the West. The clear sky turned a deeper blue than normal. As more and more of the Sun disappeared, the colours changed giving the landscape an evening glow. 08:32 - Two minutes before totality. 08:33 - One minute before totality. Somebody described it as "spooky". Even the villagers quietened down as a chill filled the air. The light was very eerie and it continued to darken, the light changing as I watched. Two dogs sped across the fields heading for home, their tails between their legs. Parakeets squawked and circled uncertainly. The monkeys had disappeared. I could see the black lunar shadow approaching rapidly at 1.7km per second. 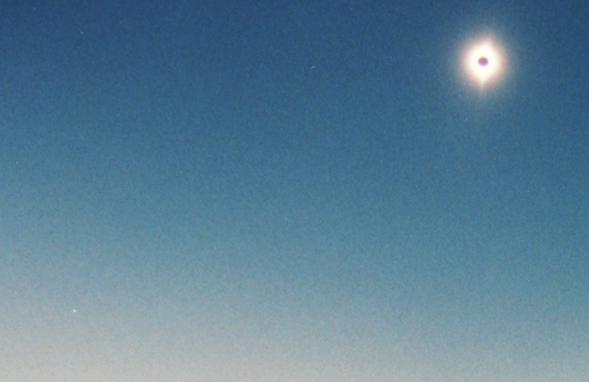 I looked up to see the thin crescent of the Sun condense into a point, flicker, and go out. Totality had begun; it was 8:34. 08:34 - Totality (the beginning). Venus can be seen in the 8 o'clock position. 08:34 - Totality (coming to the end). The eclipse was a very short one but the sky was dark. The corona very bright and I could see streamers as if someone had painted it onto the sky. The horizon had a pink glow within which I spotted Venus. All was still. The villagers were staring wide eyed and moaning gently, all interest in us gone. Venus can be seen to the left and below the Sun. Totality in Black and White. 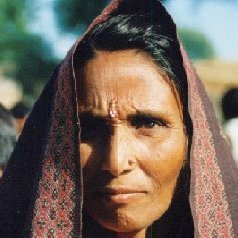 Local people in the village of Khanua. It was over too quickly. After 55 seconds the first beam of sunlight blasted its way through one of the valleys on the Moon giving a beautiful diamond ring. It hung there for over five seconds while the landscape lit up from late twilight to day. Venus disappeared. There were mixed reactions: clapping, expressions of joy, silent awe. Eric was grateful that we had persuaded him to change his itinerary and see the eclipse. As we made our way through the village, the locals came out of their houses to talk. Most had been impressed, a few had stayed in. Huge crowds followed us as we walked back to our host's house. Everyone was friendly. We paid for our food and lodging even though money was not requested. I also gave Jagmohan a map of the eclipse as a souvenir. We began walking and eventually got a lift in an empty bus heading to the next village. From there a normal bus took us to Fatehpur Sikri, a deserted Moghul city on a flat hill. I had been there in 1983 but for my companions it was a new experience. We explored, although the main topic of conversation was the eclipse. Many people had viewed it from here so there was still a buzz of excitement around the place. Back in Agra the owner of the guest house had not seen the eclipse. He told us that in 1980 there had been another eclipse. One of his trucks had caught fire so he thought eclipses brought bad luck. He did not want anything to happen to his business again. One of the rickshaw drivers came in to see us. He was from Khanua and had heard that we had been there. He wanted to know if we had enjoyed his village. The next day's newspapers were full of stories and anecdotes . . . .
Fatehpur Sikri "saw the mighty Sun being humbled awesomely by an insolent Moon". 10,000 "stupefied people" admired the sight, "gushing and clapping". "A few stars twinkled near the humiliated Sun as if to pacify its bruised ego". "Animated eclipse watchers watched in silent admiration, benumbed by the sight of the Sun darkened by the Moon's shadow which rushed towards them like some divine precedent of doom". A Delhi bank employee said "I stayed back as the rays might affect me and I did not eat or drink throughout the eclipse". A teacher "put tulsi leaves on all eatables and water to avoid poisoning". She continued, "although scientists say there are no chances of poisoning, why take any risk?" A government employee admitted "I have never been superstitious but I am pregnant and I am scared: so I have fallen prey to superstition". In some areas, tens of thousands of pilgrims bathed in holy rivers. A ten year old cowherd "was surprised to see his cows suddenly turn homeward as the sun's rays were blocked". Some villagers were bemused by the scientists attired in "queer outfits" and equipped with "strange gadgets". A 62 year old man refused to watch the eclipse "having lost an eye attempting to see the 1980 eclipse without protection". He had "to spend money to fix a stone eye". A mother "had remained closeted in her prayer room, fasting and praying" because "an occasion like this requires such solemnity". At Delhi airport "three Indian Airlines flights were delayed as some passengers expressed their reluctance to board the flights during the eclipse". In some places, conch shells were blown to drive away "evil forces". At one hospital, doctors were "observing the event from the roof using X-ray plates". A group of schoolchildren had been taken to the path of totality. One said "it was fascinating; most of us were against coming and sacrificing our Diwali celebrations but the visit was worth it". Some interesting science was performed by a husband and wife team from a Delhi university who wanted to remain anonymous. They "exposed mice to radiations during various phases of the eclipse and immediately started dissecting them to analyze the effects". All photos by Kryss Katsiavriades except Totality in Black and White by Richard Bellia. Thanks to John Mears for the loan of his camera. We swapped photos with several people on this eclipse and kept in touch with most of them. We were played an amusing recording of our reactions during the eclipse. Unfortunately, the casette was stolen before a copy could be sent to us. There were no eclipse t-shirts available for this eclipse; Talaat had some made up for me. Jim Twogood sent us some photos a few months later. He was not one of our eclipse group but he had shared a taxi into Delhi from the airport with us.